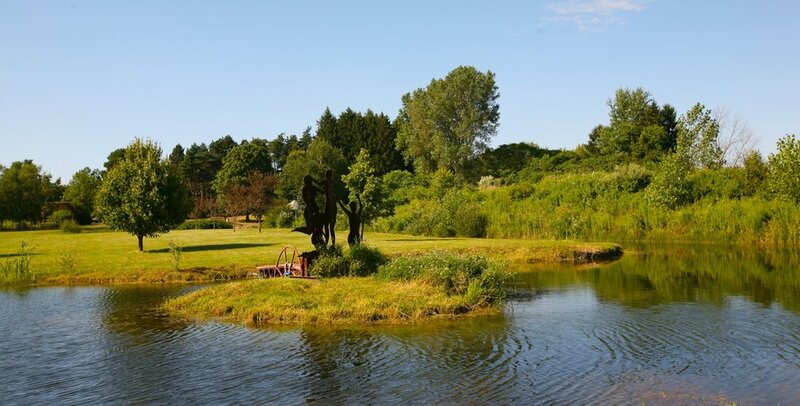 Your creativity will surely flourish at this unique artist retreat, featuring custom sculptures throughout a 20 acre property anchored by two picturesque ponds. A charming house (listed on AirBnB) and HipCamp sites on property are available for use in connection with events. We immediately connected with the owner of this property, a visionary writer and wood worker who has infused her love of nature, beauty and style across the space. Your guests will be enchanted by its dreamy vibe of creativity that settles over the manicured lawns and gorgeous fish-filled ponds. The evening is capped by regular appearances of twinkling fireflies, lighting up the dark night sky. Why is Saugatuck a destination? Saugatuck is known as much for its cultural institutions as its sweeping beaches. One of Chicagoans' favorite places for a nearby escape, full of art galleries, incredible local eats and drinks, and outdoor options like exploring the local sand dunes and simply relaxing on the beach. With the variety of activities you'll find here, you're bound to have a fun weekend.